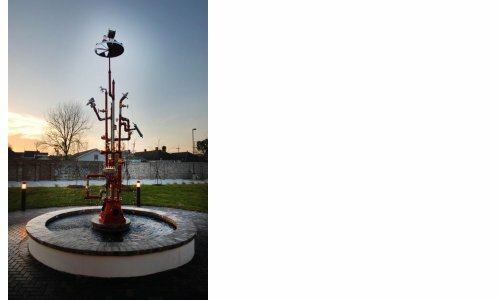 Madeleine Faust, sculptor, teacher, and artist with a strong public art presence in the city is creating works for the Blue Plate Artist Lofts from materials scavenged from the old plant. The three pieces include a 14’ tall sculptural fountain, an expansive ceiling sculpture/lighting element of aluminum and steel, and a sleek lawn structure of glass block and aluminum. Her large scale work began with the first public art piece commissioned by the Arts Council of New Orleans’ Percent for Art program, and continued with many pieces around the city including sculptures at the American Can Apartments, the French Market, and Veterans Blvd. This nearly 14+ ft. tall structure is a water feature and the centerpiece of a 10 ft. diameter pool located in the rear courtyard of the building. The inspiration for the form came from the thick maze of pipes in the original factory which carried the liquid ingredients of the products being manufactured, to the various areas to be mixed, and ultimately down to the huge vats in the basement. Struck by the beauty of the old brass and bronze valves, the lacework of the valve handles, and the stainless pipe that was used to transport certain ingredients, I cleaned and polished the brass, brushed and lacquered the stainless, painted the old black pipe, and chrome plated the handles and certain obscure but beautiful parts of machinery. The rich red color is meant to stand out against the beige and blue of the building and the green of the landscaping. 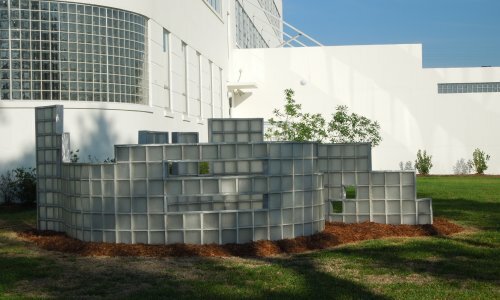 The lawn sculpture consists of two interacting walls with a combined length of 37 ft. and is constructed from the original old block that was salvaged from the signature curved front windows. The sleek, modernist lines of the piece, the low profile, and the inclusion of windows in a material that is itself used as a window reflects the spirit of the design of the factory. In fact, as a free-standing glass block structure with no visible anchoring support, it is as unique in its application as the building itself is in this old traditional city. The sculpture will be a subtle accent to the area during the day, and take on a different presence as it glows through the night. Solatubes by day. I thought it would be fun to incorporate light into the piece at night. Light Beat resembles a heart beat type monitor line, punctuated with little explosions of dandelion type fiber optic elements. 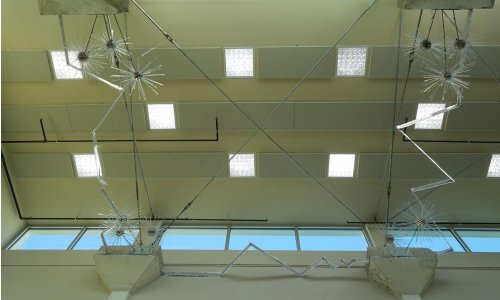 The linear structure is made from the old aluminum measuring sticks that were bolted to the sides of the vast vats in the basement. The balls at the center of the fiber optic spheres were the floats from inside the vats, and the plastic tubes that hold the fibers come from the kitchen, which still had drawers full of measuring pipettes.